To make a healthy choice and to understand why one is healthy and the other is not, it is good to know how oatmeal is produced. Because 'oatmeal' comes from the cereal 'oats'. Oatmeal is the germinated (shell removes) version of oats and if only the shell is removed you speak of 'long-boiling' or 'whole grain' oatmeal. You don't usually find this type of oatmeal at the supermarket, but at a health food store. In addition, you also have the cut oatmeal, which is broken or cut into two parts. The advantage of this is that the cooking time is drastically reduced from 15 minutes to 5 minutes. In both this version and the 'whole' version, most nutrients and dietary fiber have been preserved. They are healthy for both of these oatmeal varieties. The latest version is the rolled oatmeal. And how could it be otherwise ... you can usually find it in the supermarket. The rolled oats are flat and sometimes this oats are sweetened and processed. You often see this when the oatmeal is already mixed with other ingredients. Therefore, with this form you only benefit for a small part from the beneficial efficacy of these grains. In fact, this variant causes peaks in blood sugar levels which you naturally prefer not to have (more about those peaks later). So ... is oatmeal healthy? The answer to that question depends on the preparation and the type of oatmeal you choose. If you eat ready-made oatmeal that is sweetened with sugar, it is by definition not healthy. Usually, the ready-made oatmeal contains only half of the original fiber contained in oats and a lot of junk is added to make it 'tasty'. In some ready-made oatmeal there is even more than 10% pure sugar. So when you ask "is ready-made oatmeal healthy?" the answer is "No!". But fortunately there is also good news! Pure oatmeal is healthy. By 'pure' I mean unprocessed oatmeal or at most 'cut'. You recognize the whole grain oatmeal by the full, round structure and it is packed with valuable food for your body. The taste of whole-grain oatmeal has a slightly more 'nutty' taste than processed oatmeal. The difference between wholegrain oatmeal and ready-made oatmeal is particularly reflected in the 'GI index'. Without becoming too technical ... The GI index indicates what nutrition does to your blood sugar. The higher the GI index is, the less healthy it is for our bodies. We speak of a high glycemic index above 70 and a low below 55. Ready-made oatmeal has a GI index of 83, while whole-grain oatmeal has a GI index of 55. See how much difference it makes ? Bring the liquid to the boil and add the oatmeal. Let it boil for 15 minutes and remove it from the heat. Let it cool down and you're done. Now we can add some things for the taste, as I show below with the recipes. 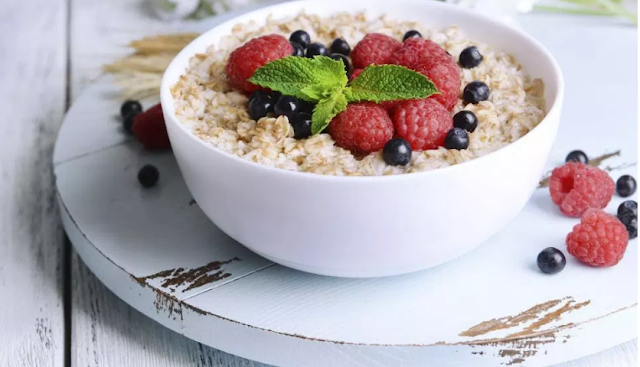 If you choose the right type of oatmeal, oatmeal can be healthy for you and boost your health. I can therefore recommend an oatmeal breakfast to anyone who wants to have a healthy breakfast or to lose weight. Because some people jump directly to the conclusion, I would like to emphasize that the 'supermarket' oatmeal is not always healthy! Go to a health food store for 'whole' or 'half' oatmeal. Would you also like to eat a little healthier, preferably without fast sugars / carbohydrates but you don't know what? Sign up now for the VIP Club of Gezondblog. You can read more about it here. 0 Response to "The oatmeal breakfast; is oatmeal healthy or not?"